By buying this product you can collect up to 355 loyalty points. Your cart will total 355 loyalty points that can be converted into a voucher of € 71,00. 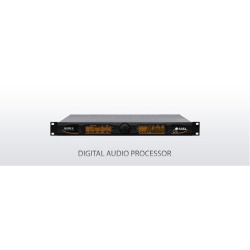 Falcon 50 FM is Axel Technology's flagship digital processor, based on 6-Bands audio architecture, delivering a crystal clear, solid sound texture with a unique superb audio quality. Whether your audio system contains analog, digital or both formats, Falcon 50 FM can be configured to fit perfectly, featuring the most comprehensive range of processing parameters in its category. Relying on Axel Technology's extensive know-how in audio engineering techniques, Falcon 50 FM has been specifically designed to provide the best voice processing ever, bone-shaking super bass and spatial stereo enhancement features with advanced peak limiting system, mantaining exceptional audio quality even at extreme settings. - Connectors: Two EMI-suppressed XLR female. - Input Configuration: Stereo / Mono L+R / Mono R / Mono L . Flat or pre-emphasized (at 50μs or 75μs), software-selectable. - Input Configuration: Stereo / Mono L+R / Mono R / Mono L. Flat or pre-emphasized (at 50μs or 75μs), software-selectable.